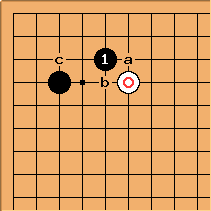 Black aims to take the corner and remove possibility of white attaching at c. White can respond at a or b or tenuki. This is a common variation. may choose to push one more time at a, exchanging with White b, before playing at or c.
Even more common is a black pincer at or around . White usually exchanges for , then jumps out. 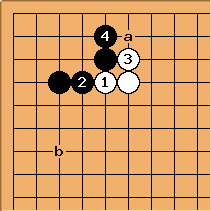 The continuation depends on the surrounding position, in particular the presence or absence of a black stone at a. White can also push with . The points a and b are now miai. 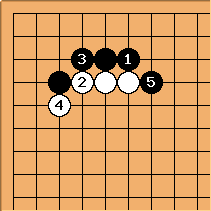 White will often tenuki in this case. Black can resist and try to start the large avalanche joseki. In fact this seems to be the most common answer in professional play. 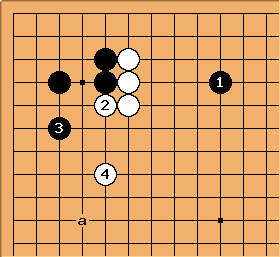 The third option for black is to withdraw with here. 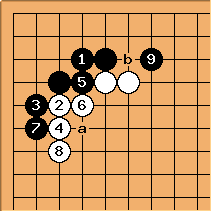 White will now usually take sente, treating her stones as light because black has answered on the inside. 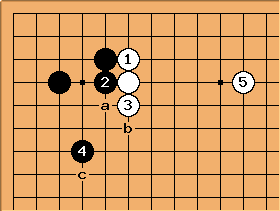 Black then has follow-up moves at or a. For white the follow-up moves are b, leading to a conversion to the 3-4 point, high approach, inside contact, solid connection, or in this diagram. The diagram shows one possible variation, there are other options in particular for .